Culture Minister Miri Regev is ramping up her battle against cultural boycotts by enlisting luminaries such as David Grossman. It’s time Israeli artists who believe in democracy to stand up and be brave. The annual Israeli Theater Prize ceremony, held every year in the northern city of Acre, recently took place without a hitch. This, despite the fact that the Jewish Israeli mayor of the city backed a decision to censor a play by Israeli actor Einat Weitzman, and while the Arabic-speaking Al-Midan Theatre in Haifa remains closed. The artistic teams behind the winning works at the ceremony stood on stage alongside Minister of Culture Miri Regev, who assails them repeatedly for their exclusive cultural hegemony. One of the big winners was “To the End of the Land,” based on David Grossman’s novel, whose creators received the Play of the Year award from the minister. Although Regev has recently presented blatant McCarthyist caricatures to support her threat of cutting the budgets of cultural institutions in Tel Aviv, this has not stopped her from joining the delegation to New York as a patron. Perhaps she wishes to receive some precious media exposure, to bash Roger Waters and Ken Loach — who have led protest against the hosting of both theaters. Protesters claim Habima and The Cameri are complicit in Israel’s oppressive policy against the Palestinian people. For Regev, this is a perfect opportunity for true “left-washing,” since the fact that a writer such as Grossman, who often criticizes the Israeli government, is granted a stage for his play under the patronage of the state, is evidence of Israel’s being a democratic state. It seems a masquerade is taking place on the Israeli cultural scene. In this masquerade. 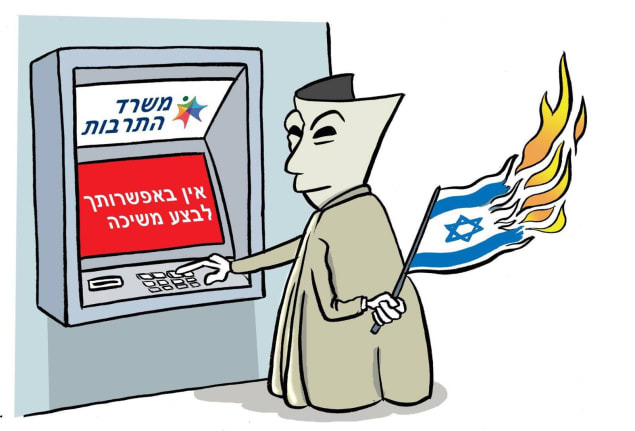 Regev plays the role of fighting for the culture of the oppressed (periphery, Jewish-Mizrahi communities), in the name of her fabricated concept of “financial freedom” (“the state has the right not to fund elements which undermine its being Jewish and democratic”). On the other side, leading Israeli cultural institutions play the role of fighting for freedom of expression and creation. Both sides profit from the public semblance of a confrontation, but in fact – they exist in symbiosis, and this serves their existential needs. Regev assumes that the struggle for marginalized voices of periphery Mizrahi Jews, while silencing Palestinians and leftists, may yield her a fine electoral crop, especially when she can can link these two policies. Regev portrays artists whose works deal with the crimes of the occupation as a disconnected, elitist Tel Avivan minority, who are expropriating funds that are due to residents of the periphery. And how have Israeli theaters responded? In a recent Haaretz op-ed, Ori Levy, the former Director of Gesher Theatre, expressed the heart’s desire of the artistic establishment in Israel: just let the wheels keep rolling. The condescending assumption that lies at the core of his argument is that cultural institutions are carrying out a sacred duty beyond reproach, and that the minister must let the show go on. Thus, Levy is only fueling the combustion of Regev’s political engine, substantiating the claims that directors of Israeli cultural institutions live in ivory towers and decide for the people what is good for them, while blocking new voices from being heard. In order to promote their desired conservation of momentum, these directors are nurturing a very polite conflict, always abiding by the rules of the game. They may have expressed concern or organized emergency panels here and there, as to the silencing of artistic voices. But they have not taken any steps against the shuttering of an Arab theatre. Nor have they stood with Israeli actor Einat Weitzman when Minister Regev incited against her at the Knesset, as one who “praises murderers and belongs in Ramallah.” They can deny this all they want, but their fear of rocking the boat directly impacts their repertory choices, which are gradually cooling down any substantial criticism. Thus, the theaters themselves are the ones who are trying to get out of the regime’s way, as part of the package deal they are after. Just as protest against plans to cut funding to Tel Aviv theaters supports Regev’s claims as to cultural hegemony, so does these theaters’ willingness to perform in West Bank settlements. Add to this their aforementioned silence in the face of the Al-Midan Theatre and Einat Weitzman affairs, and the case for BDS, as made by Loach, Waters and others, is bolstered. This tango between the Israeli regime and leading cultural Israeli institutions attests to a non-democratic sphere, one in which millions of disenfranchised subjects — Palestinians — are deprived of their basic rights, including the right to vote and determine their future. If directors of theaters in Tel Aviv would like to fight for democracy, they must do so resolutely, for example by staging the works of censored (Jewish or Palestinian) artists. The theatrical community must also replace its directors on a regular basis, and encourage artistic creation in the periphery instead of merely “exporting” its productions to it. It is the the right moral choice, which can also preempt Regev’s arguments and policies. As long as Israeli artists are reluctant to pay a price for the struggle, they should not be surprised by claims that external pressure on Israel is required, or claims that they are being used by the Israeli government for the promotion of its political needs and for entrenching the occupation. Ari Remez is a theatre director and teacher. This article was translated by Ofer Neiman and first published in Hebrew in The Hottest Place in Hell. Read it here. It’s SO reminiscent of the debates over boycotting apartheid-era South Africa. For those to young to remember, South African artists and sportspeople and their supporters overseas couldn’t see why they couldn’t just carry on doing their thing. Why does nobody like us? (I’m not saying it was the same situation; SA sports teams, cultural groups and all venues were strictly segregated which isn’t true in pre-67 Israel). Boycotters didn’t hate Afrikaanaers as such; we hated what they were doing and the racist apartheid system. The same is true for Israelis. All the supporters of BDS I know don’t hate individual Israelis, they hate injustice, oppression, occupation and a society based openly on racist privilege. A state that proclaims itself a Jewish state, ignoring 20% of its people. A state that rules over – or controls by siege and through proxies – millions who have no rights in that state. When the pain of boycott, as well as the even greater strength of resistance, became overwhelming, the more intelligent white South Africans knew the game was up and negotiated a path to majority rule and desegregation. As soon as that happened, we were happy to welcome SA rugby and cricket teams to our shores, to go there on holidays and so on. No privileged group gives it up by being asked nicely. particularly, when their position is reinforced by an all encompassing national-religious ideology which says they are superior and entitled to the land. Smart Israelis should sort out the situation while there is still a good chance to enjoy the peace dividend. Full Palestinian rights and equality and there will be no boycott. Of necessity, the above is not detailed, but the principles are clear. Boycott worked in Montgomery, boycott worked in South Africa, boycott works in Israel. Israel is not the same as any of those places. It is much more complicated. The Stein-Kavanagh exchange above really encapsulates the smug assumptions of the American right wing Jewish establishment, and its self-righteousness. Oh please. I have the same reaction as Kavanagh.